Photo: The spectacular Banana Mountain. The spectacular Buddhist complex of Ko Yin Lay, commonly known as Banana Mountain, lies around eight kilometres out of town on the highway north. 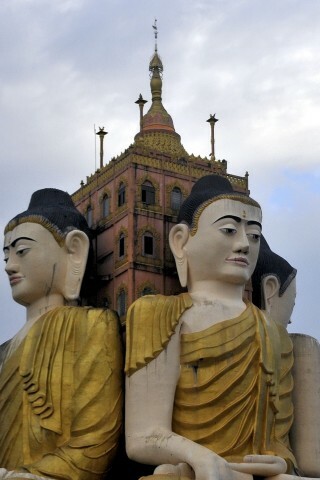 Burmese come from afar to visit this elaborate hilltop temple and monastery. Head out of town on the main Mawlamyine highway and after passing the old Japanese aerodrome on your right, look out for the temple access road bordered by two white lion statues on your right. Head through the rubber plantations and you’ll emerge at the first buildings in this large complex. These are the standard temple fixtures, though in this case they are rather elaborate, with multiple shrines and Buddha images. You may also hear piped Pali prayer chanting. Further left, and far from standard, is the temple’s highlight: four huge seated Buddha images facing towards the cardinal points and backing on to a square central tower. The interior has nine floors full of rather gaudy Buddhist imagery and scenes from religious mythology. There are the usual graphic Buddhist hell scenes, popular in these parts, and the whole resembles the interior of the giant reclining Buddha at Win Sein Taw Ya, between Thanbyuzayat and Mawlamyine. The view from the top is worth the climb. The only drawback for us was the collection of caged wildlife: monkeys, gibbons and deer, though we’re not sure under what circumstances the temple came into possession of the animals. Ko Yin Lay is around a 20-minute ride if you have a bike or some 6,000 kyat return by motor-taxi. We hired a bike for a day and combined it with a trip down to Bin Le Wa Beach.